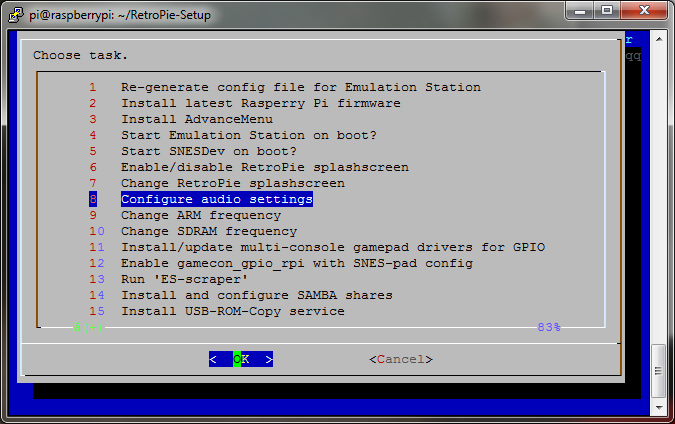 RetroPie is a great multi-emulator project for the Raspberry Pi, but I noticed that its auto-detect for which audio device to use seems a bit erratic. I’ve speakers plugged into the 3.5mm jack, as the HDMI cable runs to a speaker-less monitor, and usually (but not always) RetroPie defaulted to squirting sound out the HDMI port. To run this command, either switch to another terminal session (e.g. Ctrl-Alt-F2), and log in as user pi, password raspberry (defaults, unless you’ve changed them), then Ctrl-Alt-F1 to switch back to the GUI. 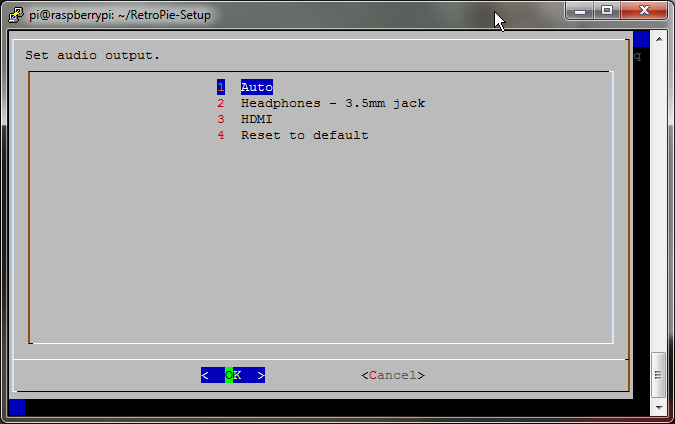 Alternatively, from another machine, you can SSH into your Pi and run the command in the shell there. This will bring up the config screen. Choose option 8, “Configure audio settings”. Then choose either Headphones (for the 3.5mm jack) or HDMI as necessary. I was looking for this, thank’s for the help! Is there any way to have both? I have built an arcade table and I put an extension socket on the side to extend one of the USB sockets and the 3.5mm audio. I would like to run the sound through HDMI to the speakers in the monitor but have the ability to plug in external speakers to my extension socket. I tried extending from the headphone socket on the TV but it stops the sound from the inbuilt speakers and when plugged o to the Pi I get nothing. The guide above is great and allows me to switch but would like both to work simultaneously. Previous Previous post: Finally! The version of RSG you’ve been waiting for!